Share the post "Needy but not Greedy"
About a month ago or so I met with an elderly woman who lost her husband earlier this year due to a sudden death so she decided it best to move to a city closer to where one of her children lived. I was referred to her by one of her friends with whom I worked with some years ago and as chance would have it, I remembered talking to her and her husband when they were out touring open houses about 20 years ago. They were working with another agent at the time but I did chat with them from time to time whenever they arrived at an open house I was hosting. In visiting with her and noticing the number of books she had accumulated, I could tell she was not only well educated but also well read. I did my inspection of the home while being accompanied by one of her children and when I came back to where she was seated, I sat down and began telling her what I thought of her home. She interrupted me and said, “Before we get started Mr. Chodur, I want you to know I’m a person who is needy but not greedy.” In all these years of visiting with sellers, I’ve never heard such a comment. I smiled and said, “I’ll make sure we’re both on the same page.” I spent about an hour or so sharing my thoughts on value as well as recommending a few improvements. She agreed and decided to list her home. Her comment about needy but not greedy seemed to stick with me over these weeks as it popped into my mind a number of times. 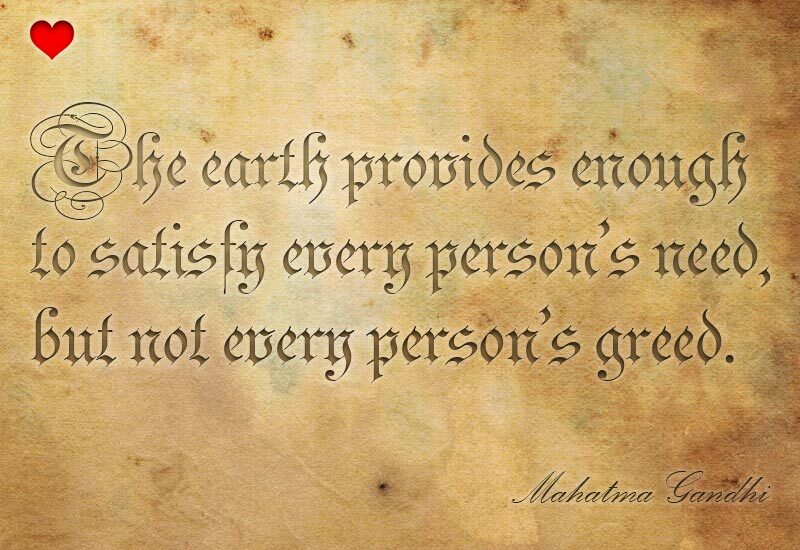 In expanding on that thought, one is left to consider how needy must we be until it turns into greed. I recall a number of colleagues in real estate over the years mentioning something like, “My baby needs a new pair of shoes.”, or “I’ve got hefty health insurance premiums to pay.” and even, “I need to get my big mortgage paid down.” I’ve heard many of the justifying comments about the need to acquire money and wealth. The ones making the comments were doing quite well and simply wanted to justify their greed by appearing to be in need. My elderly client must have heard many of those same comments and wanted to clarify her need versus greed. As much as I would often times like to say to those who seem to continue their near fanatical accumulation of wealth, “When are you ever going to consider you’ve accumulated enough?” I think it but don’t say it due to their obsession with money and power and likely any words from me would be better spent on saving my breath to cool the soup. I’ve encountered a few of the greedy ones in our community and they do seem to be driven by an invisible force. Watching these people from afar, they appear a bit comical; they scurry about like squirrels looking for the next walnut they can run off with and stash away. When I was young and working out in the grove of a widow lady’s farm whom I worked for occasionally, I happened to notice one squirrel running about gathering nuts and hiding them in the attic of an old shed nearby. What was so funny is that while the possessed squirrel was out picking up every nut it could find, another squirrel was slipping in to the shed and stealing the gathered nuts and running of to it’s hiding place. It causes one wonder which squirrel was needy and which one was greedy.